(VEN) - The Vietnam Manufacturing Expo (VME) 2018 will showcase new technologies and manufacturing solutions when it takes place in Hanoi from August 8 to 10, as part of an event on promoting the growth of Vietnam’s manufacturing industry with the new concept on an intelligent factory. 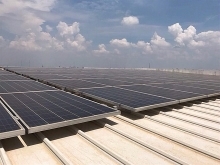 At a press conference held on July 4, Suttisak Wilanan, Deputy Managing Director of Reed Tradex, said, in recent years, Vietnam once again moved to speed up in a new industrial revolution - Industry 4.0. Manufacturers can’t ignore the thrumming beat calling for the ability on customization, precision, high-speed production, and the transformation from analog to digital operations in Industry 4.0’s era. “In other words, the process of automated factory under the operation of 24/7 vision systems or smart factory is set to begin,” he said. Suttisak Wilanan added, “In the era of Industry 4.0, an integration of several new technologies has opened up new kinds of automated systems, such as “collaborative robots”, or Cobots - a robotic system designed to safely work alongside with humans”. Monetary Watch reported that, after a factory in Dongguan, China, applied robots to their production line, their productivity rose by 250 percent, while defects dropped by 80 percent. Since then, the benefits of upgrading to automation have been revealed including greater efficiency, better productivity, less production downtime, and many more. At this year’s return, besides of over 200 innovative technologies and machineries exhibited at the event, Vietnam Manufacturing Expo coordinates with Universal Robots to organize the practical “Co-bot Showcase”, in order to promote the potential applications of Cobots, while working closely with human operators. “At this showcase, with the excellent movements of the high-caliber robots, it will lead to many interesting possibilities and discussions on the changing place of robot in the business world and manufacturing sector in particular,” Suttisak Wilanan said. Suttisak Wilanan also unveiled the four co-located events at Vietnam Manufacturing Expo to create a comprehensive platform for manufacturing. These include Vietnam Sheet Metal; Vietnam Electronics Assembly; Robot X; and Industrial Components & Subcontracting Vietnam. The Vietnam Electronic Industries Association (VEIA) will return as an official forum supporter at Vietnam Manufacturing Expo 2018. At the forum, the participant can have a chance to directly discuss and learn from experts in various manufacturing sectors be it automotive industry, electronics industry, and other supporting industries. 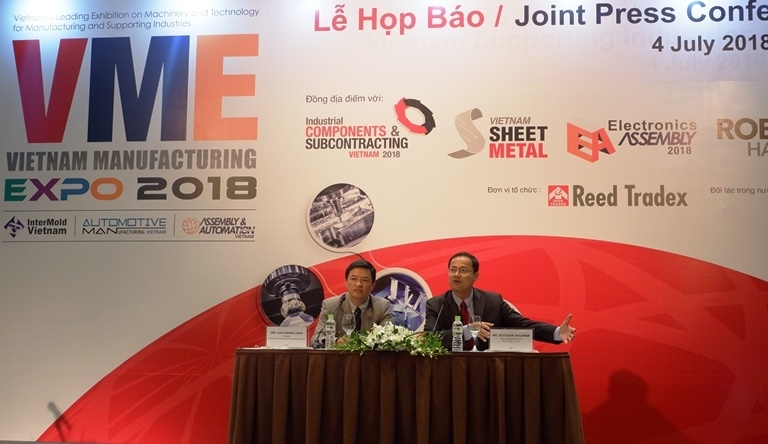 VEIA President Luu Hoang Long said at the press conference that according to the Ministry of Industry and Trade, a total of 661 businesses currently operate in support industries, including 591 electronic components manufacturers, 56 computers and peripherals manufacturers, and 14 magnetic tapes and disks manufacturers. However, the number of domestic enterprises capable to supply support industry products for FDI companies in the electronics sector remains limited. It is therefore necessary to build and tighten linkages between domestic and FDI businesses. Various activities will be conducted during the three days of Vietnam Manufacturing Expo 2018, such as Business Matchmaking Service to support all participants in finding right target agents, suppliers or future business associates. The Vietnam-German Technology Transfer and Training Center (HWC) and Reed Tradex Co., Ltd. will co-organize the Vietnam Welding Competition to search for the best welding master and encourage Vietnamese industrialists to see the importance of upgrading their welding skills.